Occupy Wall Street reminds the 99% of Americans that the top 1% get way more than a fair share of the wealth and income. When it comes to wildlife and the power to manage it, us commoners have a hard time, too. About 31% of Americans actively go out of their way to watch wildlife, according to the latest USFWS survey. Only 5% hunt. But wildlife is overwhelmingly managed to the benefit of the dwindling number of largely older white men who hunt. Is that fair? There’s some overlap between the 1% of households by wealth and those who hunt. 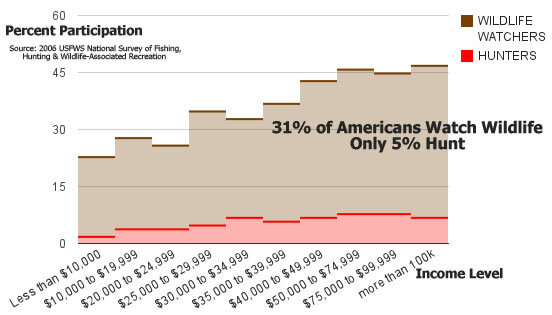 Only 2% of the poorest Americans hunt. Only 1% of black or hispanics hunt. But 7% of those making more than $100,000. It’s not the firemen and school teachers paying prices like $15,000 for four days camping to hunt elk. I don’t care how many pink rifles are sold or futile events the NRA sponsors to draw in the ladies: only 1% of women hunt. The real problem is that many state wildlife boards have a requirement that some or all of its members hunt. That’s like setting up a school budget committee and saying all the members have to be senior citizens on a fixed income. The system is set to see every situation through one perspective. Can you imagine if birders decided they wanted to spend vast amounts of public money and land raising colorful birds from China and letting them go in our ecosystem? No. But we an incredible 19 states pay to raise and release pheasants, a bird native to China. They spend $10-$12 per adult bird, says Casey Pheiffer, an HSUS wildlife abuse expert. Can you imagine if wildlife watchers wanted to manage the moose population so they could see them everywhere they pleased? No. But that’s more or less what we’re doing with deer, elk and feral pigs. Deer and wild hogs are managed to get maximum “recreational use”–even though they cause all kinds of car accidents and damage to forests and farms. The whole feral pig problem can largely be traced to the rise in popularity of pig hunting. Hunters liberate pigs from farms and hunting grounds so they can have the fun of shooting them later. Many PA hunters insist on only shooting males–even though that drives up the population. Over and over wildlife decisions are made for the ever dwindling number of old guys who hunt. In 1950 10% of the population hunted; now it’s half that. They’re dying off and so is their financial power. In 2006, they spent $23 billion. That’s a lot of money–unless you compare it to wildlife watchers, who spent $46 billion. Like the old British aristocracy they try to copy, the 12.1 million hunters blow an average of $1,832 each. The commoners, the 71 million wildlife watchers, spend $642. The same survey shows wildlife watching is also higher among the rich (40%), but nearly one-quarter of those at the bottom rungs enjoy it, too. And, why not? It’s free! In fact the survey goes out of its way to exclude wildlife watchers. In order to count, the wildlife watching has to be the “primary purpose” of the event or trip. So, if you go look for elk or eagles on a roadtrip you were taking anyway, that doesn’t count. The survey doesn’t know how to compute or put a value on someone who just casually enjoys seeing birds and mammals. And neither does our political system.